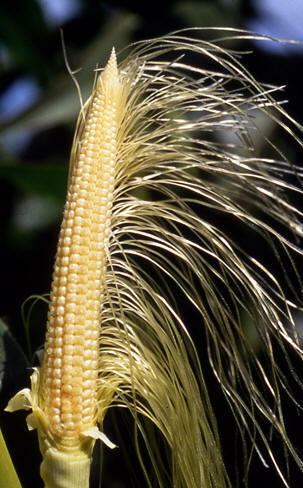 Corn has both male (tassel) and female (ear) flowers on the same plant. Male flowers on the tassel mature when anthers emerge from spikelet flowers, and pollen is dispersed through holes at the tips of the anthers. The tassel is usually fully emerged before any pollen is shed. Pollen shed begins at the middle of the central spike of the tassel and spreads out later over the whole tassel with the lower branches last to shed pollen. Pollen shed usually begins two to three days prior to silk emergence and continues for five to eight days with peak shed on the third day. All of the pollen from a single anther may be released in as little as three minutes. On a typical midsummer day, the shedding of pollen is in the morning between 9:00 and 11:00 a.m. Cool, cloudy, humid conditions will delay the onset of daily pollen shed. Because of natural field variability in plant development, a whole field may take as long as 14 days to complete pollen shed. Female flower parts on the ear include the ovule (kernel) and stigma (silk). Silk elongation begins 7 to 10 days prior to silk emergence from the husk. Every potential kernel (ovule) on an ear develops its own silk that must be pollinated in order for the ovary to be fertilized and develop into a kernel. A well-developed ear shoot has 750 to 1,000 ovules (potential kernels) each producing a silk. However, under good conditions only 400 to 600 ovules will be fertilized and eventually produce kernels The silks from near the base of the ear emerge first and those from the tip appear last. Under good conditions, all silks will emerge and be ready for pollination within 3 to 5 days and this usually provides adequate time for all silks to be pollinated before pollen shed ceases. Under favorable conditions, a pollen grain upon landing on a receptive silk will develop a pollen tube containing the male genetic material, develop and grow inside the silk, and fertilize the female ovary within 24 hours. Pollen grains are borne in anthers, each of which contains a large number of pollen grains. The anthers open and the pollen grains pour out after dew has dried off the tassels. Pollen is light and can be carried considerable distances (up to 600 feet) by the wind. However, most of it settles within 20 to 50 feet. Pollen shed is not a continuous process. It stops when the tassel is too wet or too dry and begins again when temperature conditions are favorable. A pollen grain stands little chance of being washed off the silk during rain storms as little to none is shed when the tassel is wet. Also, silks are covered with fine, sticky hairs that catch and anchor pollen grains. Pollen of a given plant rarely fertilizes the silks of the same plant. Under field conditions other plants in the field pollinate 97% or more of the kernels produced by each plant. The amount of pollen is rarely a cause of poor kernel set. Each tassel contains from 2 to 5 million pollen grains, which translates to 2,000 to 5,000 pollen grains produced for each silk of the ear shoot. Shortages of pollen are usually only a problem under conditions of extreme heat and drought. Poor seed set is more often associated with poor timing of pollen shed with silk emergence (silks emerging after pollen shed). There are two techniques commonly used to assess the success or failure of pollination. One involves simply waiting until the developing ovules (kernels) appear as watery blisters (the "blister" stage of kernel development). This usually occurs about 10 days after fertilization of the ovules. Another more rapid means can be used to determine pollination success. Each potential kernel on the ear has a silk attached to it. Once a pollen grain "lands" on an individual silk, it quickly germinates and produces a pollen tube that grows the length of the silk to fertilize the ovule in 12 to 28 hours. Within 1 to 3 days after a silk is pollinated and fertilization of the ovule is successful, the silk will detach from the developing kernel. Unfertilized ovules will still have attached silks. Silks turn brown and dry up after the fertilization process occurs. By carefully unwrapping the husk leaves from an ear and then gently shaking the ear, the silks from the fertilized ovules will readily drop off. Keep in mind that silks can remain receptive to pollen up to 10 days after emergence. The proportion of silks dropping off the ear indicates the proportion of fertilized ovules (future kernels) on an ear. Sampling several ears at random throughout a field will provide an indication of the progress of pollination. Figure 1. Silks still attached to a corn ear. Figure 2. 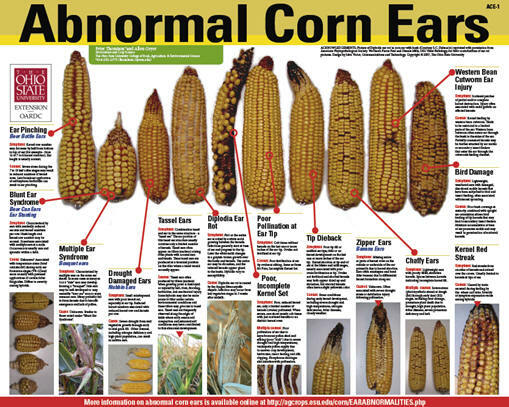 Abnormal Corn Ears poster from Ohio State (see http://agcrops.osu.edu/specialists/corn/specialist-announcements/ear-abnormalities).